On Friday November 28 at Alliance Française, Placemakers and Naipolitans organised the kick-off event for the ‘Making Cities Together Project’, an international knowledge exchange programme organised by Placemakers, The International New Town Institute and The International Federation for Housing and Planning. The programme, running from September 2014 to September 2015 in Kenya researches local Placemaking initiatives, connects them in a platform and will develop strategies to improve them in co-creation. In this kick-off meeting Naomi Hoogervorst from Placemakers presented the outcome of the Inventory on Placemaking Initiatives in Nairobi. Placemakers conducted this inventory with students of the Technical University of Kenya. 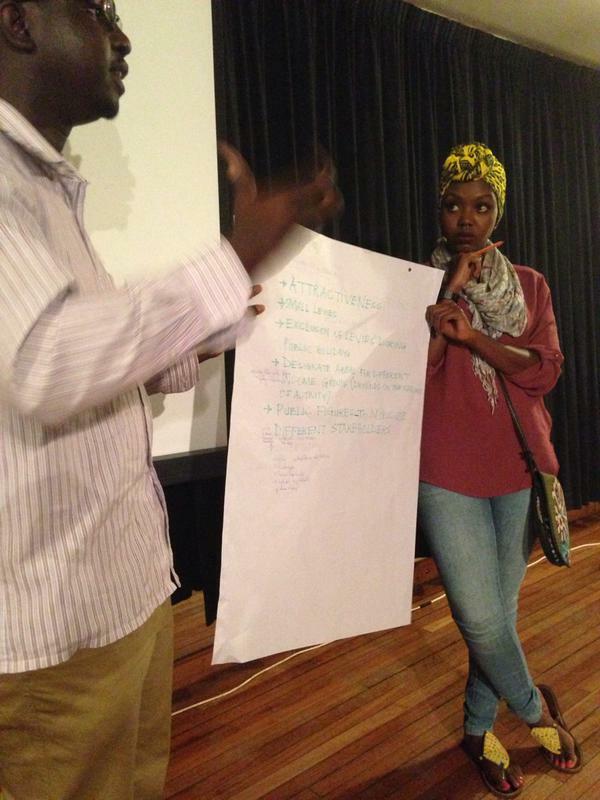 Moreover, it was the first step to create a platform of place-makers in Kenya. 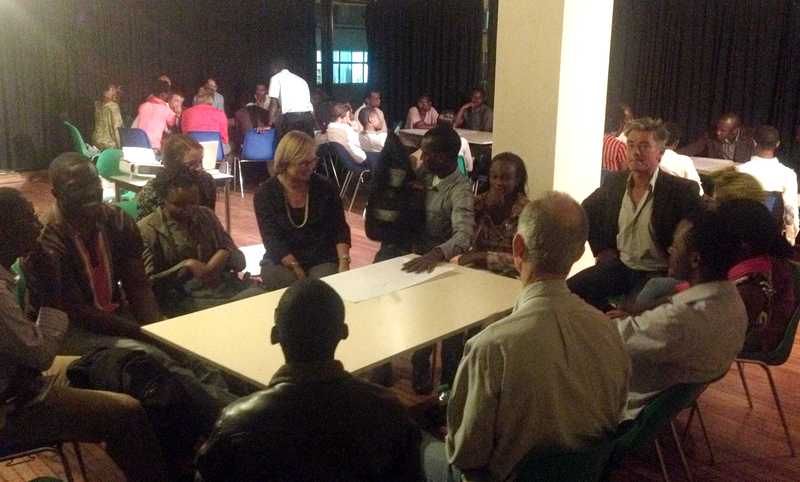 A multi disciplinary group of architects, planners, urban designers, sociologists, anthropologists and activists (both Kenyan and international) attended the meeting and were actively involved in a lively workshop on how to create high quality public spaces in Nairobi. The outcomes, published in the Inventory on Placemaking initiatives, show that a lot is happening in Nairobi’s public spaces. Some initiatives are widely known, such as the Green Belt Movement, but many of these initiatives are far away from the limelight. It appears that local communities are increasingly taking charge of their environment. They are revolutionising the use and experience of public spaces, like in the skating events in the streets of Korogocho, the social/environmental activities at Mathare Community Youth Centre and the re-imaging of courtyards of Dandora Estate. The initiatives ultimately result in a higher quality public spaces given that the communities are co-owners and therefore create a sustainable base for long lasting and low cost succes. It turns out that these projects are facing similar challenges like funding, political interference, land ownership and community engagement. A good example of a successful initiaitive is the Kounkey Design Initiative that creates productive public spaces in collaboration with local communities in the informal settlement of Kibera. Bukky Ngobi of KDI shared their experiencies and strategies on how to create ownership and connecting small scale iniatiatives. Sharing successes and failures is essential for other initiatives to improve. Naomi Hoogervorst emphasised the positive institutional developments in Nairobi: “By giving room for programming of public spaces, like the Sunken Car Park with a successful Maasai market and a popular skating park in the weekends, the Nairobi City County is slowly but steadily responding to this paradigm shift…” The Nairobi City County, represented by senior urban planner Patrick Analo, underlined that there is a growing willingness at the City County to cooperate with public spaces initiatives. Despite neoliberal tendencies in the city, the Nairobi City County affirmed that common good prevails as far as public spaces are concerned. Emphasising the importance of public spaces, Analo stated that public space is a right and not a privilege recognized by the recently launched Nairobi Integrated Urban Development Masterplan (NIUPLAN). In the coming years, the city is expecting an ambitious public spaces regeneration programme under the Safer Nairobi initiative, the localised version of UN-Habitat’s Safer Cities Initiative. While lauding the gains made on public spaces, UN-Habitat’s Cecilia Andersson noted that a lot still need to be done in terms of changes in legislations, by-laws and perceptions in order to encourage the use of public spaces and streets in particular. Explaining opportunities, she pointed out the need for business owners not to see benches adjacent to their shops as opportunities for criminals but as an opportunity for more eyes on the street. It is such a shame that in this age and time, one can still be arrested for loitering in the streets. High bureaucratic processes were also cited as a major challenge to the management of public spaces in Nairobi. Organised in breakout groups, the participants discussed the requirements and ideas for making great public spaces, such as ‘sustainability vis-à-vis inclusion’, ‘activities and uses’ and ‘spatial interventions’. The brainstorming session gave rise to very interesting feedback. In her own words, Bukky Ngobi, Urban Designer at the Kounkey Design Initiative said, “We need to make a public space sticky…transform it from a space you can’t wait to get through to a place you don’t want to leave. Public spaces in Nairobi need interventions: design, performance, street art and furniture can make places more accessible, secure, and more beautiful…” In general, the participants agreed that small interventions and vibrant activities can have a great impact. For example, street bands on Tom Mboya square and free Wi-Fi hotspot at Jeevanjee Gardens. On a larger scale, ‘ownership’ and ‘security’ came out as major concerns in the sustainability of public spaces. However, it was noted that only with inclusion of all stakeholders ranging from the government and the private sector to the general public will this be addressed and solved. For this kick-off meeting, Placemakers and Naipolitans brought together over 70 professionals and students dealing with Nairobi’s public spaces, including representatives of UN-Habitat, Nairobi City County government, universities, embassies, the European Union, NGO’s and CBO’s (community based organisations). The high number of participants show that more and more people think Placemaking, making better public spaces in co-creation with its users, is a viable option in creating better and more sustainable solutions in city planning. In Kenya, and Nairobi in particular, there is a rising interest in public life and an increased demand for public spaces across the city, from Kilimani to Korogocho. It is widely accepted that with better public spaces, Nairobi becomes more liveable, will attract more tourists, build a stronger social capital, foster civic pride and positively impact quality of life for its residents. Placemakers and Naipolitans are convinced that by bringing all actors and stakeholders together in a platform to share experiences, challenges and solutions, it is possible to create more impact in making successfull and inclusive public spaces. The attendants were very engaged and thoughtful and became real Place-makers! Given that Placemaking is quite a new concept in Nairobi we see a lot of potential in the creation of good public spaces in the near future.